Rob Scuderi won't be the Los Angeles Kings' leading scorer this season and he might not even reach the double-digit mark in goals. But that doesn't mean the pride of Long Island isn't one of the most valuable players on a team bent on making inroads in 2010-11. Although his offensive numbers might not grab your attention, Scuderi, a native of Syosset, New York, was one of the most coveted unrestricted free agents in 2009. A reliable, stay-at-home-defenceman, Scuderi was a major presence on the Pittsburgh Penguins team that hoisted the Stanley Cup in 2008-09, a gritty, gutsy blueliner who goes about his job in an understated, yet highly-respected manner. In short, he was a wanted man. So when the 2009 free agency floodgates opened, it didn't take long for Scuderi to find a new home, as he signed a four-year deal with Los Angeles on July 2 of that year. Coveted for his unselfishness both on and off the ice, Scuderi is an ideal fit on a Kings' defensive corps that boasts one of the best units in the game, headlined by Drew Doughty, one of hockey's top rearguards. Almost 400 games into his NHL life, Scuderi still hasn't taken any of it for granted. “Starting out, you just want to do whatever you can to make the team and contribute something,” said the 31-year-old, who was drafted 134th overall in 1998 by the Penguins. “It really doesn't take long or for anyone to tell you that you need to work hard every minute in the NHL. 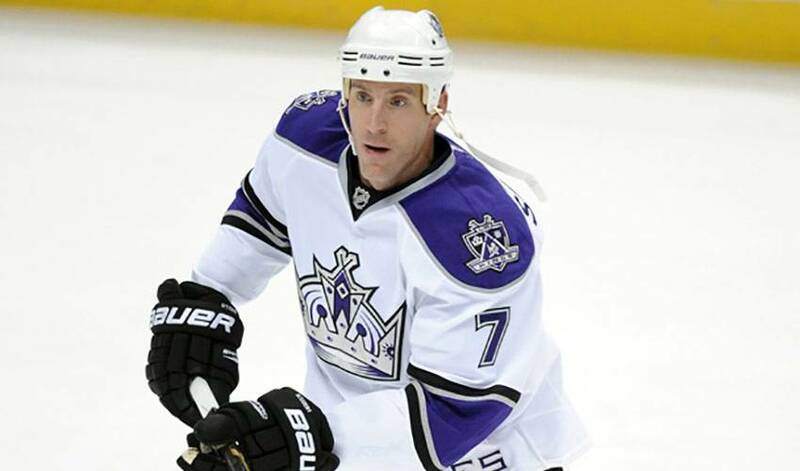 Scuderi attended St. Anthony's High School in South Huntington, New York, graduating in 1997. After high school, Scuderi attended Boston College, where he played four seasons for the Eagles. Following his freshman campaign, where he recorded 24 assists in 42 games, he was drafted in the fifth round by Pittsburgh. Scuderi decided to stay at Boston College for three more years. At the end of his collegiate career, he held the Eagles' record for most games played, making 169 appearances. He played his final game for Boston College in the 2001 NCAA Division I Men's Ice Hockey Tournament championship, a 3–2 overtime victory for the Eagles. In 2001, Scuderi started his professional career in the American Hockey League with the Wilkes-Barre/Scranton Penguins, Pittsburgh's minor league affiliate. That season, he played in 75 games, notching one goal and 22 assists. Scuderi skated in his first NHL game in 2003-04. After producing three points in 13 games in Pittsburgh, he spent the 2004–05 season in the AHL due to the NHL lockout. In his second NHL campaign, the 2005–06 season, Scuderi registered four points in 56 games, but his consistent defensive work and willingness to pay the price earned him a permanent position in the Pens' lineup for the 2006–07 season, appearing in 78 games, scoring a goal and adding 10 assists. On February 2, 2008, Scuderi played his 200th career NHL game versus the Carolina Hurricanes. In early October, Scuderi ended a 120-game scoreless streak in Stockholm, Sweden versus the Ottawa Senators, when he scored a tying goal to get the Penguins to overtime, where they would get the victory. Scuderi recorded his first career playoff goal against the Philadelphia Flyers in Game 3 of the 2009 Eastern Conference Quarterfinals. He also made one of the most memorable plays in the post-season. Scuderi snuffed out a golden scoring chance by Detroit in Game 6 of the Cup Finals, with Pittsburgh holding a 2–1 lead. He stopped a shot at a wide-open net by Johan Franzen with his stick, then stopped him again by using his skate. Scuderi had five points in the playoffs and now has the distinction of being the first native of Long Island, New York, to have his name on the Cup. After one strong season in Los Angeles, Scuderi is hoping to have that chance with the Kings, a young team on the rise and one that feature one of the NHL's most balanced lineups.